Finding Heaven: Is Your Back Breaking? Let me clarify: I have no problem asking my children to help around the house or giving not-so-subtle hints to my husband that he his free to come home early so I can have a break from parental responsibility for awhile. But ask my friends to pray for me because I'm having a hard time? Ask them to take time out of their busy schedule to meet me for coffee so I can cry on their shoulder for a bit? Not really my cup of tea (or coffee). In fact, most of my friends attest that I know much about what is going on with them (I am a master question-asker), but they know hardly at all what is going on with me. When they find out later (because I'll talk after I find resolution), they lament: Why didn't you tell me about this? I could have ______________! And what they could have done (pray, help in tangible ways, etc) would probably have been amazing. And yet, I let my uncomfortableness in asking for help rob me of the relief God intended for me. 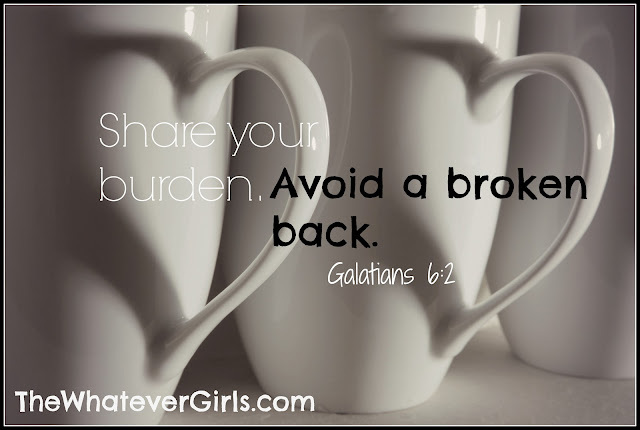 I'm talking about how we're called to carry each other's burdens at The Whatever Girls today. Continue reading on? Join me here. Comments closed so we can all chat there.